She's Fantastic: Quest for Camelot's KAYLEY! 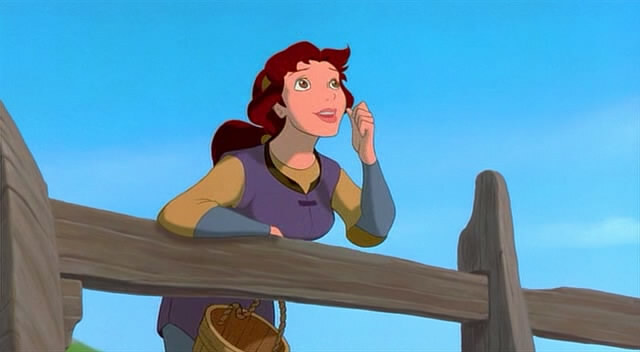 Quest for Camelot is a classic tale of a young girl who dreams of big (boyish) adventure. 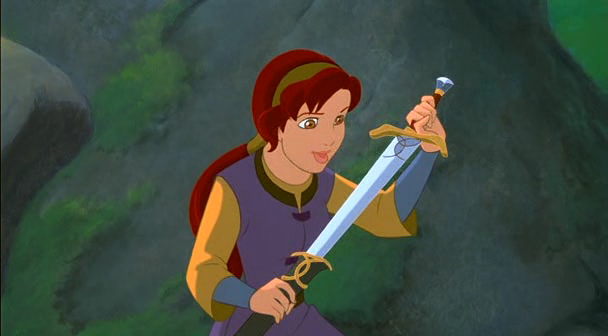 In this case, Kayley wants to be a Knight of King Arthur's Round Table like her father Sir Lionel. 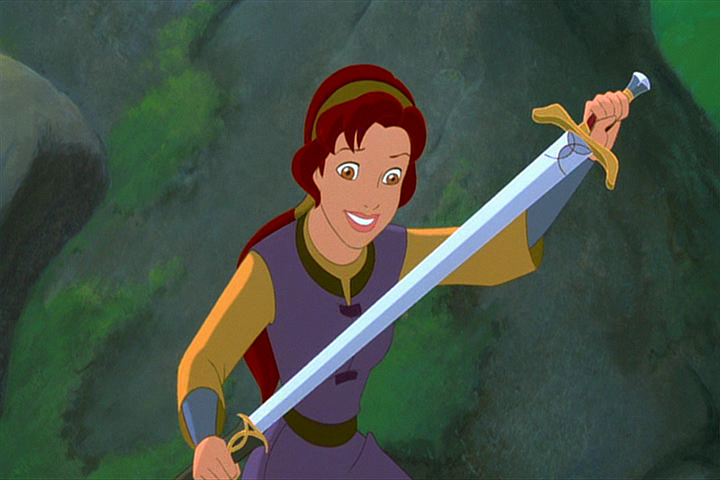 She gets her adventure when Excalibur is stolen from King Arthur by a griffin and accidentally dropped deep in the Forbidden Forest. This plot sets the scene for an adventure where brains and wit win over brawn any day. I always like to point out how movies come out in pairs (Someday I may even figure out why), and this is prime example. Warner Bros released Quest for Camelot in 1998, the same year that Disney released Mulan. Both movies feature young girls who emulate their warrior fathers and run off (without parental consent) to have an adventure. Both win out by using everyday skills and cunning, often finding unexpected solutions to seemingly impossible tasks. 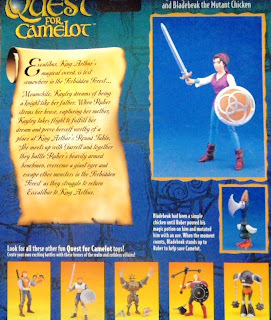 Both are very good movies, but Quest for Camelot got the better toys out of the deal. Hasbro did a great job capturing the animated quality of the characters. Let's check out Kayley below! 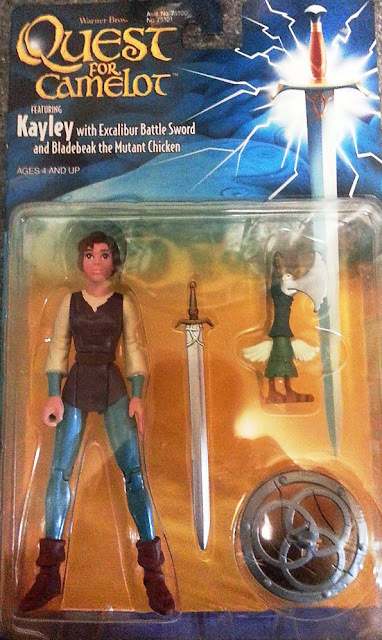 Kayley comes with a shield, Excalibur, and the mutant chicken Bladebeak. There's a whole subplot about a magic potion that infuses warriors with different weapons, and this chicken accidentally gets a dose. Her articulation is a little limited (as is to be expected from animated movie merchandise), but you can still get all the classic poses out of her. That's a pretty-looking figure, and judging from the comparison pic she's about 6 inch scale? Really nice! Yeah she's almost exactly 6 inches tall. I love finding these hidden gem figures. I'll bet a lot of stores never carried the line.